Home > Borders and Walls: Do Barriers Deter Unauthorized Migration? In 2015, borders and walls seemed to burst onto the global agenda in the context of migration and halting spontaneous movement. Countries as diverse as Austria, Bulgaria, Estonia, Hungary, Kenya, Saudi Arabia, and Tunisia announced or began work on new border barriers. This trend has continued apace in 2016, with Bulgaria, Hungary, and Austria expanding their fences, Norway building a fence on its Russian border, the United Kingdom funding a wall in Calais, France, and Pakistan building a fence on its border with Afghanistan. Border walls also became a central issue in the U.S. presidential race, with Republican Donald Trump emerging from a crowded field of rivals in large part because of his promise to build a “beautiful wall” on the remaining 1,300 unfenced miles of the U.S.-Mexico border. Meanwhile, deaths of would-be asylum seekers and migrants in transit have been on the rise worldwide, reaching 5,604 in 2015 alone, according the International Organization for Migration. The surge in interest in border walls and fences is not simply a media creation but rather represents a very recent historical trend, arising in response to the growth in spontaneous international migration. Although we often imagine that there was a past era in which most borders were secured with physical barriers, in fact the construction of border barriers is a relatively new phenomenon. At the end of World War II there were fewer than five border walls in the world, according to Élisabeth Vallet, a professor of geography at the University of Québec at Montréal. By the time the Berlin Wall fell in 1989, there were 15. Today, there are nearly 70 (see Figure 1). This rush to build new walls raises several questions: Why now? Did border walls work in the past? Do they work today? This article examines the history of border fortifications around the world, discusses the evolution of the meaning and purpose of borders, and assesses the extent to which such walls have been effective in achieving their goals. For many people, the Great Wall of China represents proof that humans have built border walls for thousands of years and that they are an effective means to protect the population from an outside threat. Reports about border walls today often reference the Great Wall accompanied by an image and a description of the barrier emphasizing its superlative age and length: 2,000 years old and thousands of miles long. However, the true history of the Great Wall is less great than we remember it to be today. The reality is that various Chinese kingdoms built multiple walls—many of which have been lost to history—over a 1,500-year period to prevent Mongol raids. The evidence of the oldest walls, said to have been built in 220 BCE, is thin: a single vague mention of fortifications in a historical text written more than 100 years after the fact. If a wall was built 2,000 years ago, no evidence of it remains today. In the ensuing centuries other walls were built out of tamped earth, but these were often seen as failures and left to erode. In a few places, archaeologists have found a faint line remaining in the landscape, but little more remains of them today. Contrary to popular belief, the famous sections of stone walls in the mountains near Beijing were not built during the time of the Roman Empire, but rather in the late 16th century during the Ming Dynasty. These walls also failed and were overrun within a few decades of their construction. As late as the Cultural Revolution in the 1960s, Chinese peasants were encouraged to dismantle the wall to use the stones for a more productive purpose. The remaining sections were otherwise largely ignored until discovered by Western travelers, who marveled at them and coined the term “Great Wall” (the Chinese simply called them “long walls”). Only in the past few decades, as the myth of a Great Wall grew, have a few sections been rebuilt to serve as tourist attractions. The walls built by Chinese emperors are remarkable today because they were historical anomalies in several ways. First, in the ancient past countries did not have fixed territorial borders, both because accurate maps had not yet been invented and the idea of a system of mutually recognized countries did not exist. Instead, most city-states and empires had frontier zones at their edges where their power diminished in relation to the distance from the seat of power. Secondly, in the past most rulers did not have the manpower or technical ability to build and guard a long wall. Walls were a common technology of defense, but usually existed on a much smaller scale around a densely inhabited city. While there are a few other historical examples of long walls, Hadrian’s Wall in Northern England being the most prominent, they served a similar purpose to the Chinese fortifications: They marked an area of defense and provided infrastructure to prevent the movement of raiders while also furthering the collection of taxes from traders. In the 21st century, the purpose of borders has changed, leading to a surge in construction of border barriers. Unlike in the past, countries now control territories with fixed borders on maps that most other governments in the world have agreed to respect, rendering the use of walls to mark territorial control obsolete. While the Mongols and the Chinese did not recognize each other’s legitimate authority over a territory, today most countries are members of the United Nations and as part of the UN Charter agree to respect the borders and territorial sovereignty of all other members. By the middle of the 20th century, most countries had stabilized their borders and generally did not expect a territorial invasion by a neighboring army. For example, the United States is not worried that Mexico or Canada is going to invade it to take territory for itself. Instead, borders became the invisible lines that marked different economic, political, and cultural systems, embodied in the nation-state. Source: Update by Élisabeth Vallet, Zoé Barry, and Josselyn Guillarmou of statistics included in Élisabeth Vallet, ed., Borders, Fences and Walls: State of Insecurity? (Farnham, UK: Ashgate Publishing, 2014). Over the past 30 years, during what has come to be known as the era of globalization, the purpose of borders shifted to preventing the movement of unauthorized civilians. In the second half of the 20th century, global populations grew rapidly, from 3 billion in 1960 to more than 7 billion today. At the same time, very large economic gaps emerged between the wealthiest and poorest places on earth, driving many people to move from rural areas to cities and eventually across borders to look for better opportunities. Meanwhile, a number of wars, most prominently in Afghanistan, Colombia, Iraq, Sudan, and now Syria, have caused millions to flee beyond their country’s borders in search of safety or prompted internal displacement. In ten years alone, the number of people forcibly displaced grew by 71 percent—reaching 65 million in 2015, up from an estimated 38 million in 2005. In addition, the fear of terrorism has played a significant role in removing the stigma previously associated with building border walls. The fall of the Berlin Wall was hailed as a triumph of freedom over totalitarianism. During the 1990s, with memories of the Cold War still fresh, countries were hesitant to begin border wall projects because they were seen as anachronistic and not befitting of liberal democracies. However, in the post-9/11 world, any actions that attempt to make the population more secure became justifiable and obligatory for governments around the world. Along with additional screening at airports, increased police presence at public events, enhanced surveillance of phone and Internet communications, the use of biometric identity documents, and the externalization of border checkpoints through vetting flight manifests and collaborating with neighboring countries to identify potential threats, border walls became part of the suite of security measures a country could reasonably take to protect its citizens from terrorism. The evidence is clear that the construction of border fortifications is a new phenomenon that has rapidly emerged on a global scale in the 21st century. As movement of civilians across borders has increased, a number of countries have turned to walls and other security infrastructure to control access to their territory. What is less clear is whether such walls are effective, the answer to which depends on what they are meant to do. Walls are not effective at stopping a modern military because planes and missiles go over them and tanks can smash right through. Nor is a border barrier necessary to mark the territorial extent of the country. Walls are expensive and maps, boundary stones, and GPS data work just as well for this purpose. But what about their use as a way to keep out unauthorized migrants? While advanced as a popular solution, the evidence is mixed on whether walls are effective at preventing large movements of people across borders. Of course, there is little doubt that walls short in length and heavily guarded with troops or law enforcement officers can be very effective at stopping movement. This is the logic behind medieval city walls and prisons today. Indeed, short sections of walls have also proved effective at decreasing movement across international borders. This was demonstrated in the 1990s on the U.S.-Mexico border when the first sections of fencing were built in El Paso and near San Diego, supported by large deployments of Border Patrol agents. In the weeks that followed, crossings in those sectors dropped to almost zero. Similarly, the construction of Hungary’s border fence in 2015 was backed up with border guards, and consequently, crossings dropped substantially. However, in both cases fortified walls did not prevent crossings into the United States and European Union entirely, but instead shifted flows to other locations that were more remote or less fortified. In the U.S. case, as high-traffic urban routes were closed, migrants and smugglers began to cross in the remote and dangerous deserts of western Arizona. Child migration from Central America to the United States, which surged in 2014, has also been undeterred by enforcement (in fact most unaccompanied minors turn themselves in to border agents), as tens of thousands of children from El Salvador, Honduras, and Guatemala spontaneously arrive at the U.S. border with Mexico to claim asylum, many knowing they would be admitted into the U.S. pending removal hearings. In the European migration crisis in 2016, once land routes through the Balkans were closed, migrants adjusted by shifting their routes to board boats across the Mediterranean, frequently from Libya. The funneling of migrants to alternative routes points to one statistic that correlates closely with the construction of more walls: an increase in the number of deaths. As easier routes are closed, migrants choose ever more dangerous paths to reach their destination. At the U.S.-Mexico border this was evident in the decline in deaths in California which coincided with a rapid rise in Arizona. The Tucson, Arizona coroner’s office saw a substantial increase in the number of migrant deaths in the years after the hardening of the border, as migration routes shifted to the more dangerous deserts. The Tucson morgue recorded an average of 18 migration-related deaths per year in the 1990s, while in the 2000s it saw almost 200 per year. In 2010 the Border Patrol found more than 250 bodies in the Tucson sector, despite a decline in the total number of border apprehensions. Similarly, when the European Union and Member States fortified borders in 2015, there were a record 3,771 reported deaths at the edges of the European Union. In 2016, with the easier land route through the Balkans and Eastern Europe closed, the rate of deaths has increased further, with more than 3,000 deaths recorded through July—a 50 percent increase from the previous year. By comparison, there were just a handful of deaths recorded annually at the edges of Europe in the 1990s, and never more than 800 deaths prior to 2006. Despite these clear material impacts on the lives of migrants, millions of people globally continue to cross borders without authorization—meaning walls are relatively ineffective. The first reason is that on longer borders, it is extremely difficult to fence the entire length and adequately guard it. Building fencing or a wall also entails acquiring the necessary land, building and maintaining roads, and supplying the necessary manpower to guard the barrier. The U.S.-Mexico border only has fencing over one-third of its 1,969-mile length. Even the heavily fortified Israeli wall in the West Bank is only two-thirds finished. A second reason that walls are not effective is that many unauthorized movements, particularly those of terrorists or smugglers, do not happen between crossing points. A significant share of unauthorized immigrants in the United States entered with a valid visa and then simply never left, overstaying the terms of their visa. Additionally, many smuggled goods come through ports of entry or through tunnels built under the walls. The United States has found 150 tunnels under the U.S.-Mexico border since the 1990s, some of which are quite sophisticated with ventilation systems and even rails to quickly move carts. Israel has begun construction on a subterranean wall on its border with Gaza in order to address the dozens of tunnels it has discovered. Source: Photo taken by author. If walls did not work in the past and today only work to divert, not prevent, migrant flows—while simultaneously having a grave human cost—why have so many gone up in the past 30 years? They are effective as symbols that demonstrate that politicians are doing something to address the perceived threats brought by unauthorized movement. These perceived threats can be economic in the form of smugglers or workers taking revenue and jobs from citizens. They can be cultural in the sense that migrants bring different traditions, languages, and ways of life that might not match with the local culture. While these underlying issues are complex and very rarely solved by whether or not a border is secured, “build a wall” is an evocative slogan and the barrier itself is a powerful visual symbol of action. Consequently, despite the expense and questionable effectiveness, it seems likely that in the short term there will be many more walls going up around the world. What remains to be seen, however, is how long they will stay up. Anderson, Bruce, and Bruce Parks. 2008. Symposium on Border Crossing Deaths: Introduction. Journal of Forensic Sciences, 53: 6–7. Dear, Michael. 2013. 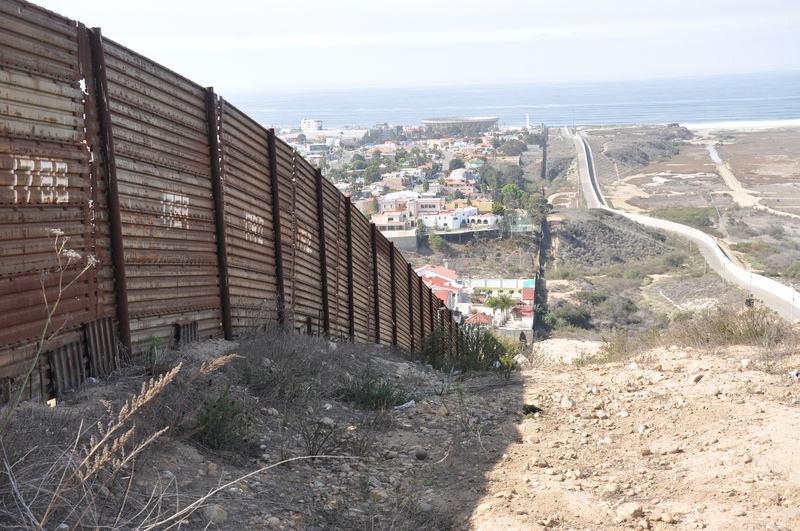 Why Walls Won’t Work: Repairing the U.S.-Mexico Divide. Oxford, UK: Oxford University Press. Di Cintio, Marcello. 2013. Walls: Travels along the Barricades. Berkeley, CA: Soft Skull Press. International Organization for Migration. N.d. Missing Migrants Project. Accessed September 20, 2016. Available Online. Jones, Reece. 2012. Border Walls: Security and the War on Terror in the United States, India, and Israel. London: Zed Books. ---. 2016. Violent Borders: Refugees and the Right to Move. New York: Verso. Lovell, Julia. 2006. The Great Wall: China against the World, 1000 BC – 2000 AD. New York: Grove Press. Mountz, Alison. 2010. Seeking Asylum. Minneapolis: University of Minnesota Press. Nevins, Joseph. 2010. Operation Gatekeeper and Beyond: The War on “Illegals” and the Remaking of the U.S.-Mexico Boundary. New York: Routledge. Slack, Jeremy, Daniel Martínez, Alison Lee, and Scott Whiteford. 2016. The Geography of Border Militarization: Violence, Death, and Health in Mexico and the United States. Journal of Latin American Geography, 15 (1): 7-32. United Nations High Commissioner for Refugees. N.d. Figures at a Glance. Accessed September 20, 2016. Available Online. Urrea, Luis. 2004. The Devil’s Highway: A True Story. New York: Little, Brown. Vallet, Élisabeth, ed. 2014. Borders, Fences and Walls: State of Insecurity? Farnham, UK: Ashgate Publishing. Waldron, Arthur. 1989. The Great Wall: From History to Myth. Cambridge, UK: Cambridge University Press. Walia, Harsha. 2013. Undoing Border Imperialism. Oakland, CA: AK Press.